We woke up to the intense Hawaiian sun shining in with it’s undeniable warmth. The day had begun. Outside the window was a view of Waikiki and it’s tall towering white buildings of apartments and hotels. From the 24th floor, to the right we could see patches of blue ocean and to the left we could see the long straight canal. In front of us was Diamond Head prominently situated at the end of Waikiki. The skies were blue as they always seem to be in Hawaii and it looked like a beautiful day. Making our way down to the little French breakfast place in the hotel, we devoured their amazing ahi sashimi benedict and mixed berry pancake soufflé. The flavors were delightful. As one of the major highlights of Waikiki, we took the #2 bus over to Diamond Head, an extinct volcano used as a lookout during war times. Having been circling the northern hemisphere in winter the last month or so, the only shoes I had were thick black boots, ballet flats, and the flip flops I bought in Waikiki. So hiking in ballet flats it was – ha! We made our way up the long driveway to the main park entrance passing through a tunnel that cuts into a section of the rim. Inside the crater, which has been dormant for an extremely long time so no longer resembles anything you would see on the discovery channel of a volcano, is a parking lot and the ticket booth, $1 for walk-ins. The path is well taken care of and catered to tourists of all energy levels and footwear. It winds through the crater and up the rim closest to the ocean taking advantage of all the shade possible. Once at the top and finished with the seemingly endless back and forth of the trail, the long staircases, the round stair cases, the walking tunnel, and the final staircase, there are 360 views – the ocean, Kahala, Waikiki, Honolulu, the mountain range, and more. It was gorgeous and we snapped pictures left and right like all the other tourists. It was my second time climbing and definitely worth the repeat. We had to check out of our room at noon, so headed back down the mountain and took a taxi instead of the bus to make sure we weren’t late as the lady threatened to charge us $45 if we were even a minute late. This Hawaiian Monarch hotel is really unlike no other. The taxi driver hearing we were from NYC took that as an invitation to tell us how much she loved Trump and all the things she loved about him. It was certainly a controversial election that really divided America and as most people weren’t happy with any of the options, I’m surprised in the service industry she would so openly rave about her political views. I don’t mind having discussions pro-Trump or pro-Hillary or pro-no one as long as the person has educated arguments, but when they clearly don’t know what their talking about it’s just embarrassing if you voted the same or frustrating if you voted different. Back at the hotel and overlooking the canal, we were reminded how much we wanted to do the canoes but there’s never enough time to do everything and we knew the afternoon would bring the most wonderful luxuriousness and didn’t want to miss even a minute of it. We crammed all our stuff back into our luggage, checked out and were off to catch the #20 bus to the airport to grab a rental car. The local buses at $2.50 per ride are full of the most interesting characters and the ‘real’ Hawaii. Much like the NYC subways are full of the ‘real’ New Yorkers. People from all walks of life, business people, average people, kids, adults, the elderly, and the riffraff, the homeless people with mental illness or on drugs (couldn’t tell). The ride from Waikiki to the airport took about 40 minutes, it always seems like it would be shorter because with a car it’s only 15-20 minutes. Once at the airport we made our way over to the National Rental Car and up to the 4th floor in the garage for the Emerald Club. Having status makes travel so much easier, we literally just looked at the car options, grabbed a car and were on our way. As simple as that. 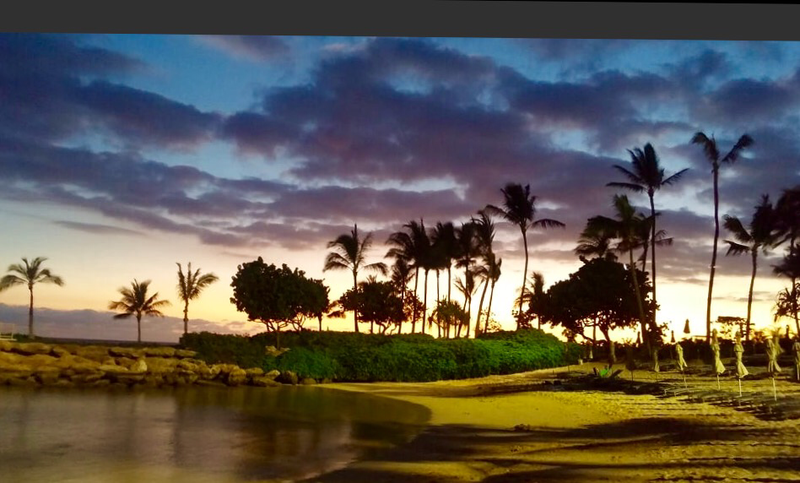 Highway 1 goes from airport to the NW side of the island and is an easy 25 minute drive up to one of my favorite places on earth – Ko Olina. A few years back I had saved up all my Marriott points and cashed them in on the JW in Ko Olina, at the time I could only do one night. It was magic, a part of Oahu I’d never seen before, it was quiet and beautiful with horse shoe shaped coves to create a protection area of ocean to play in. As soon as I had a taste, I spent the last 7-8 years where I would save up all my Marriott points during the year (or United points if I didn’t have enough Marriott points) and cash them in every December on my annual trip to the JW in Ko Olina. It became my only ritual hotel in the world, the only place I’ve loved so much it got put on a rotation. Almost two years ago on my last stay in the JW they told me later that month they were closing down for a year and a half as they sold to the Four Seasons. No!!! My annual ritual of relaxation would be gone, I knew there would be no way I could afford the Four Seasons, no Marriott points to use to stay for free, and the amount of United points needed would be excessive (over 100k per night!). I was so sad until this past June when they opened and published a Travel Zoo coupon for 60% off. Normally the rooms are $700/night – craziness! As soon as you get off the highway you see a different side of Oahu, the grass is lush and green, there’s a gorgeous golf course off to the left and beautiful single family homes for rent to the right. You cross over a tiny train track where they do rides for the kiddos and pass Paradise Cove where all the tourists come for their signature luau. Around the corner is the towering beautiful Four Seasons where every room has a large comfortable balcony and ocean view. Pulling into the driveway I noticed the road to the parking garage had been covered in a lush green grass and it had become valet only. Nice. They took care of the car and luggage, gave us fresh flower lei’s and a bottle of water and walked us to the front desk where we were greeted with a fresh ginger juice and wet towel. Life was good. Our room was on the 15th floor overlooking to the south part of the island and high enough we could see all four of the horse shoe coves that make up this area, with beach after beach after beach. The ocean a gorgeous blue with patches of aquamarine. The balcony was large enough for two comfortable chairs, a table, chaise lounge and a lamp. It had a long planter with lush green leafy plants that lined the entire balcony. Inside the bell boy gave us a tour – the iPad with information on the hotel, booking the restaurants, menus, activities, the thermostat that automatically shuts off when you open the balcony, the super fluffy pillows and duvet cover on the bed, the double sinks, the huge closet, the big screen TV, the bar counter, the espresso machine, the $128 bottle of champagne for purchase, the bathroom the size of my studio apartment, and so on. This place is amazing! After settling in, it was already 2pm and somehow the bulk of the day had been squandered. A pace I wasn’t used too and it was in that moment that I realized how differently I use time and how quickly it can get eaten up in little things. Having skipped lunch we were starving and made our way to the pool bar. There was a counter off to the side overlooking the ocean which made the perfect back drop for our first meal at the resort. They had run out of the BBQ rib tacos and we proposed taking the poke from the appetizer and putting that in taco shells as well, they were super accommodating and it was quite tasty. It felt like their policy was ‘yes’ to any question that started with ‘could we do…’. Love it. The resort was busy, much busier than my prior visits as normally I come in the off season and this was clearly still prime time. The beach area was filled with kiddos of all ages splashing around, paddle boarding, making sand castles, with parents doing double duty trying to catch some sun and watch the kids. Checking in at the beach’s hostess stand, the lady grabbed two soft beach chair covers and a couple towels and headed over to front row seats with an umbrella. The ocean waves were calm and breeze was just present enough to keep the temperatures perfect. As the sun began to set everyone made their way over to the infinity pool and lawn area to watch the pinks and oranges set just along the horizon. The clouds were the just right for a gorgeous sunset without blocking the view, but enough to accent the colors. Bright purples showered the sky as it set completely and everyone piled back onto the warm beach for one last dip in the ocean before the day would be done. There’s nothing like watching the stars in a bikini on the beach with the sound of the ocean in the background. This is heaven. The resort has a few dinner options – a high end Italian restaurant, a fish restaurant, and a pan Asian restaurant. During the daytime it adds the outdoor bar area restaurant that also services the pools and beach area. Wanting to maximize resort time the upcoming days, tonight was the perfect night for the Monkey Pod a couple blocks away, one of my favorite little restaurants nearby. Live music was playing and we took seats at the bar with mostly locals to enjoy the delicious Hawaiian flavors and a nice glass of wine. The spacious balcony provided the perfect place to finish off the night staring into the stars and reminiscing on what a wonderful life this is.